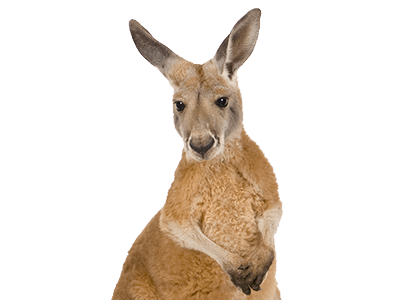 Kangaroo Facts and Information. Anatomy, feeding, reproduction, habitat and more. There are four known species of kangaroos that belong to the macropus genus. The red, the eastern gray, the western gray and the antilopine. Relations between humans and kangaroos. Kangaroos in popular culture. Kangaroos belong to the family of marsupials. When most of us think about a Kangaroo the thoughts of a large and curious animal enters our minds. We also think about them hopping and youngsters peeking out from the pouch that is part of their unique anatomy. In Australia this particular animal is a symbol of their land and shines throughout different aspects of their culture. There are four distinct species of Kangaroos out there. They are the Red Kangaroo, The Eastern Grey Kangaroo, The Western Grey Kangaroo, and the Antilopine Kangaroo. Each of them has distinct areas where they live and characteristics. If you are interested in Kangaroos then you definitely want to take some time to find out about each of these different species. Kangaroos generally hop at a speed of about 13-15 miles per hour. Kangaroos have an average lifespan from four to six years. Many people are very impressed with the pouch on the females that she carries her young in. This is often of the facts that people immediately think about when they are talking about the Kangaroo. The photos of them peaking over the top as they ride around with her are enough to melt just about any heart. Another element of this animal that people are excited about is them hopping. It is believed this is a way for them to quickly get around but at the same time to be able to save their energy. Research shows that each Kangaroo does about the same number of hops per minute. The distribution for Kangaroos is Australia. Some of the subspecies have been located throughout the county. These animals seem to do very well in captivity, and many zoos have them on display. In fact, they are a prime attraction for bringing lots of people to the zoo on a regular basis. The environment that Kangaroos live in continues to change due to the efforts of humans. They do seem to be highly adaptable to such changes most of the time. Even so, the fact that their natural environment is becoming smaller makes finding food and shelter a very serious problem for many of them. They do consume only plant life and they will eat quite a bit of it. One of the problems where these animals graze though is that their incisors are sharp enough to cut the grass they consume very short. As a result that makes it very hard for it to grow back and offer future vegetation for them and other animals. In fact, many experts are amazed by the fact that the Kangaroo has been able to adapt to the dry climate of Australia. The fact that they are able to evolve as necessary in order to survive in their surrounds is part of the reason why these animals continue to thrive in the wild. Even so, their numbers continue to drop at a rate that has made many people alarmed. Many people kill wild Kangaroos in their natural habitat as well. They do so for a variety of reasons. They includes eating their meat, for the love of hunting such an animal, and even to clear them from certain areas. It isn’t uncommon for their habitat to be turned into an area for farming or ranching. These animals have to be eliminated from the area though for those efforts to be a success.